Harvey Weinstein presided over The End of Manhood and the world is a better place for it, at least to read almost anything from the internet or newspapers (if newspapers are still read at all in this Brave New World). In politics, the arts, business and even the most intimate of relationships, men are falling like leaves in autumn. Now we are relegated to raking up the leftovers of our errors and hauling them out to the curb to be picked up and hauled off. The financial misdeeds of off-shoring one’s personal or corporate tax responsibilities are old news, yesterday’s stuff. Who cares what Trump did or didn’t do in Davos? All eyes are now on Stormy Daniels and every woebegone member of the British Presidents Club. News cycles may well be faster-than-a-speeding-bullet, but #MeToo has legs. That hashtag is on every man’s mind. Out with them all. Men are over. It’s time for them to fix lunch for the kids and pick them up at school, if they can be trusted with the keys to the car. They may possibly be allowed to select a wine for dinner. Even serving one’s country has now become a humiliation. The result of that distortion gave us seventeen ludicrous Republican candidates in 2016, the least capable and most disingenuous of whom became our president. As ye sow, so shall ye reap. On the Democratic side we had no meaningful primary. Democratic National Committee gave us a flawed candidate because it was Hillary’s turn. Hillary’s turn, as though the whole enterprise of selecting a presidential candidate was a metaphor for schoolyard baseball times-at-bat. In an eyewink, simply being a man has become a potential humiliation as well. Maybe we’ve earned it. Maybe not. Certainly each day’s breaking news suggests we have. It hardly matters. Roaring back from that defeat of the first woman seriously qualified to run for the nation’s most powerful office, Harvey Weinstein walked in with the keys to the future of women in modern society. Too long detached from equal rights in a male-dominated culture, women turned on their male counterparts with a fury born of centuries of second-class citizenship and #MeToo swept America like a tsunami after an earthquake. It was a long time coming, no doubt far too long a time. Yet like a tsunami, it swept away all before it. I don’t pretend to know what will come from this, but we will almost certainly lose much of value along the road to gaining equality of gender. Revolutions are made of such stuff. They take decades and sometimes centuries to work things out and settle themselves. 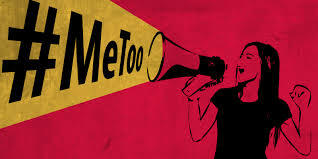 Yet a word of caution: #MeToo is the clarion call of freedom-fighters for women and their demands for sexual, social and economic equity. The caution is to hope equity doesn’t over-spend its budget.